To make your visit enjoyable and efficient, please search for books you would like to read before coming to the library. You can search for rare books in our online catalogue the same way you would search for any other books. If a book is in the rare books room, the description beside the call number will say “John Richard Allison Library Rare Books” in bold. You can also limit your search to the rare books by using the shorthand: "b8: rare" in conjunction with other shorthand. For example, type: "b8: rare AND au: Baxter." Remember--spelling for titles and names of antiquarian books may be different than modern spelling even in the catalogue, so trying several different searches is best. Once you have found a book, contact the Circulation Coordinator via email, telephone, or in person to request to see the book. If you do not know how to find a book, try using our research guide or contacting the Puritan Project Assistant, Jenny-Lyn, who also provides research assistance as well as brief tours for those who are interested in the rare books but do not have specific research goals. The door between the rare books room (where the books are stored) and the reading room (where you may read rare books, since they cannot be checked out) will be kept locked when you are using books. If you think you may require more than one book, please notify the Circulation Coordinator. If you would like to spend time in the rare books room in order to look in the stacks yourself, you will need to have permission from a member of the library staff. Using rare books in the reading room is a special experience that includes some important guidelines; please come prepared to meet these conditions. 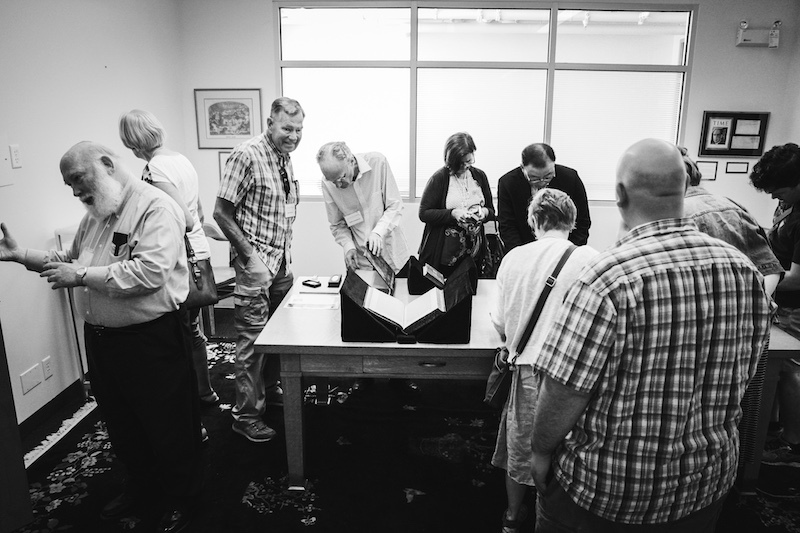 We do not allow the use of pens, white out, sticky notes, or any other materials that could damage the rare books. You may use a pencil, paper, and laptop to take notes. A pencil and notepad are provided in the rare books room but we encourage you to bring your own note-taking supplies. Please do not make notes in books or on top of books. Food, drinks, and backpacks are also not allowed in the reading room. If you require a locker, ask the circulation desk worker for the key and put your belongings in the locker before going to the rare books reading room. Finally, please sign in on the sign in sheet. The rare books reading room must be kept locked at all times and rare books cannot be checked out of the library. If you have to leave the room, close the door behind you and ensure it is locked. When you return, ask the Circulation Coordinator to unlock the door. You do not need to put the rare books that you used in another room as long as the door is locked. When you are done using the rare books, leave them on the table in the reading room, collect your things from the locker, return the locker key to the circulation desk, and sign out.